Memorial Day, Mr. Justice Holmes and Professor Ronald K.L. Collins « Hercules and the umpire. Today is Memorial Day, 2015. I write about Mr. Justice Holmes, and Professor Ronald K.L. Collins‘ classic, The Fundamental Holmes, A Free Speech Chronicle and Reader, Cambridge University Press (first published 2010). Regular readers of this blog know that I regard Professor Collins very highly. He is a first-rate scholar and a beautiful writer. His recent interviews with Judge Posner and resulting analysis are among the best contemporary original scholarship I have read. See, for example, here. Like Posner, who wrote The Essential Holmes: Selections from the Letters, Speeches, Judicial Opinions, and Other Writings of Oliver Wendell Holmes, Jr., (Paperback – January 1, 1997), Collins is fascinated with Mr. Justice Holmes. In Collins’ The Fundamental Holmes, the professor traces Holmes’s view on free speech over the seventy-year span of the great man’s life. Each chapter includes Collins’ incisive commentary followed by cases and other writings that illustrate the Justice’s views on free speech. Just a moment ago, I described the book as a classic. That is not hyperbole. In this post, I do not intend to review Collins’ book. Others far more capable than I am have done that and I have no desire to gild what is plainly a golden lily. What I do intend to do in this post is to use Collins’ book, and Holmes himself, to write about Memorial Day. 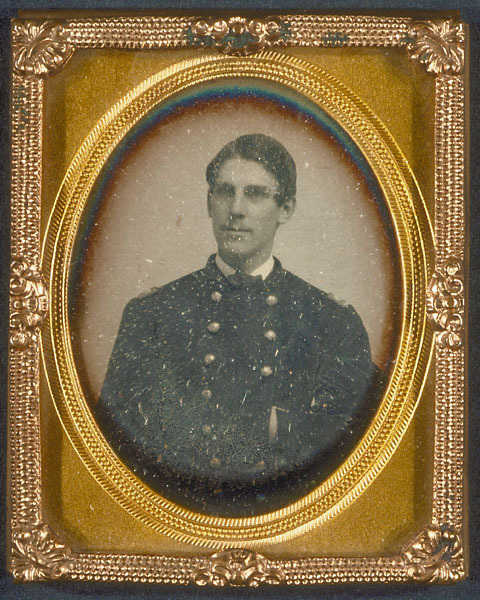 Daguerreotype portrait of Oliver Wendell Holmes, Jr., by Oliver Wendell Holmes Sr. Image courtesy of the Harvard University Library. The defining event in the life of Oliver Wendell Holmes Jr., was the Civil War. After graduation from Harvard, he became a first lieutenant. He was wounded at the battle of Ball’s Bluff in Virginia. He was shot through the neck at Antietam Creek, Maryland. He was shot in the heel at Fredericksburg, Virginia. In a world bereft of certainty, bloated by comfort, and intoxicated by greed, he hoped to revive the great Phoenix of the soldiers faith. And that faith was inextricably tied to duty, which in turn was linked to the value of struggle as a core principle of life. In the broad sweep of it, the fog of Holmes impassioned rhetoric dimmed a glaring truth–it was the fight, more than what is fought for, that was to be valued. The Fundamental Holmes, at p. 35. I agree with Collins. While Holmes thought the assumption of eternal truth is both arrogant and ignorant (a point of view that I endorse), Holmes did believe in something. Life itself was an end unto itself. The performance of one’s duty to the fullest extent is the hallmark of a life well-lived. Holmes delivered a Memorial Day address on May 30, 1884, at Keene, New Hampshire. Collins has reconstructed the speech from various sources. I quote two passages from that speech as illustrations. It is worth remembering the Justice’s remarks–even though a 131 years have passed since they were first composed and uttered. And it is worth thanking Professor Collins for fulfilling his duty to the fullest in The Fundamental Holmes. Have any 9 served in the military? Off hand, I think not. Regretfully, no. And that reminds me of Holmes words from this very same address (“…it is required of a man that he should share the passion and action of his time at peril of being judged not to have lived.) 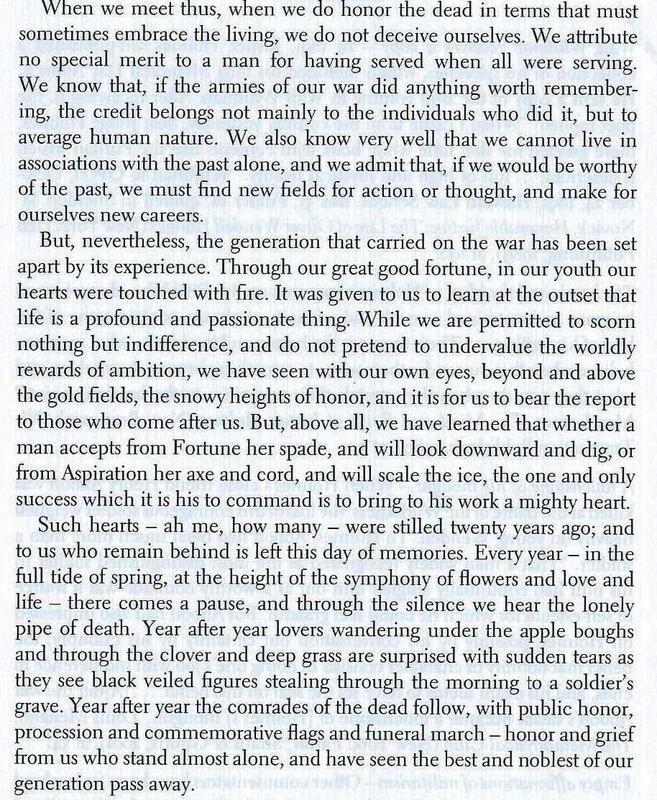 Absent war or some other great upheaval, how can a man that enjoys the fruits of peace and plenty know if, in fact, he has shared the passion and action of his time? It seem that my Baby Boomer generation has been asking itself that question for decades without an acceptable answer. The great shame of my life was my avoidance of service in Vietnam. I can’t wash it off. I am a much lesser man for having done so. Holmes tried so hard to escape the Doctor’s shadow, and the romanticism of the prior generation of the New England Mind, but his views on war demonstrated how incomplete the escape was. Refreshing to see that same romantic spirit displayed by you and Robert. Judge, although I am sure you already know of it, you might want to check out Holmes’ early writings from the Civil War: Touched With Fire. It contains his diaries from late in the war and letters home throughout his service. 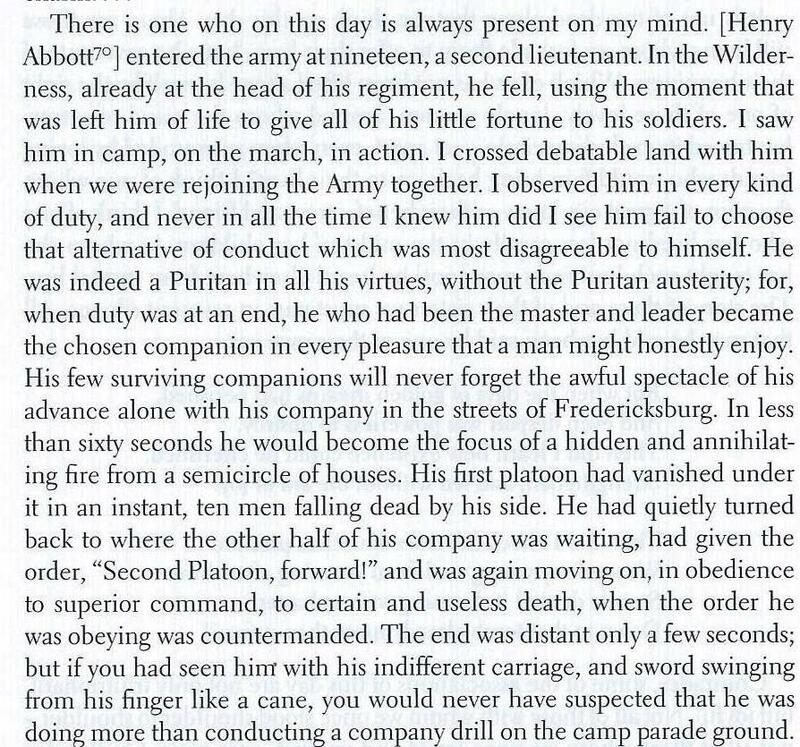 They lack much of the vividness that defined his later writing, but considering that he was probably more concerned with recovering from his wounds at Ball’s Bluff or avoiding freezing to death at Fredericksburg, I think they hold up well. As always, you are too kind. Thank you. It is one thing to fight in a just war, but quite another to fight in a for-profit one. The carrion who rule us use our military as its enforcement arm, and profit handsomely from conflict. War is a wealth-transfer scheme. Our Founding Fathers understood that the danger in maintaining a large standing army is that there is an overwhelming temptation to use it. The only stain from Vietnam would have been to fight in that war.